Burton Book Review Rating: 5 big stars! For readers who enjoy the style of Kelly O'Connor McNees (The Lost Summer of Louisa May Alcott) or Kathleen Grissom (The Kitchen House), or if you enjoyed Stephanie Cowell's Claude and Camille, this second novel by Robin Oliveira delivers a powerful punch with her beautiful prose. It's not so much the story in itself, it's the magnificent flow of words that ecompasses so much. I absolutely loved Robin Oliveira's first novel, and again here I noticed right away the style of writing- how Oliveira effortlessly portrays images, feelings and undertones of despair that captures what Belle Epoque Paris may have been all about in the artist's world. She's got me a believer of the relationship between Edgar Degas and Mary Cassatt (I'm not going to spoil anything, you'll simply have to read it) and there is nothing in the entire novel I would have changed. It is a story that evolves around the painters residing in Paris at the time, and one that is depressive in nature. If you can't embrace either of these two themes I can understand some readers being turned off by the tones of the book. If you have experienced loss, or subject to melancholy moods and can empathize with struggles of the creative person than I don't see any reason why you shouldn't adore this story of the struggles and loves of Mary and Edgar. And yet, it is so much more, as it includes their circle of friends and thus becomes a panoramic view of the ever-changing needs of society. 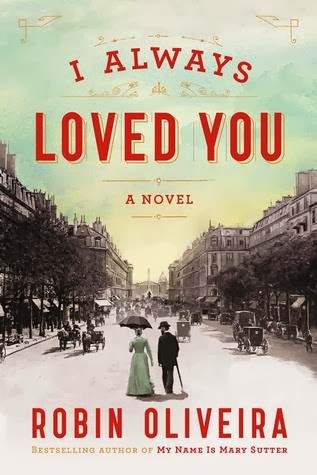 It doesn't bounce between all the characters, but we do have a vivid look into Edouard Manet's and Berthe Morisot's lives along with the secondary characters (including Mary's family) who completely fill out this evocative and emotive novel of the late 1800's in Paris. "Oh the prose!!!! 'You uttered them and they evanesced, but if you wrote them, they remained, though whether the written word was any more truthful than the spoken was a mystery to her.'" I simply loved the whole thing - the story and the writing, and will gladly read anything by Robin Oliveira for the rest of my life. I have a friend who wants to read this too, and my first thought is I need to give this to her, but I just can't let it go. I am going to have to read it again. And only maybe then can I share the joy and the heartbreak of the story. For now, it's just too personal, and it's mine to keep. Thank you to Robin Oliveira for touching my heart and putting together sentences the way that you do. Brava!